Union Pool was the name on everybody’s lips when The Cut published a feature chock-full of tales framing the Williamsburg bar and venue as a notorious (and often beloved) hookup bar, even going as far as calling it a “boyfriend store.” While all this is surely true (I wasn’t a Williamsburg frequenter during the bar’s sexual heyday, so I can only rely on hearsay), heavy petting isn’t the only reason people go to Union Pool. There’s also music. Specifically, dance-noise-art-rock-punk-etc band Guerilla Toss will be playing a weekly show there each Tuesday for the month of June, starting tonight. Guerilla Toss released their last album, the psychedelic, fast-paced, and electronically-tinged GT Ultra, last year. Pitchfork called it their “most nuanced work yet” and “the aural equivalent of flooding the eyes with strobe lights.” As per an Instagram post, the band will be switching it up every week, playing new stuff, old stuff, “shredding bizarre covers,” and more. They’ll be joined by a variety of creative noisemakers, such as Future Punx, Operator Music Band, Kalbells, and Puerto Rican “punk puppeteers” Poncili Creacion. The last time I saw Guerilla Toss was at Sunnyvale and I had what I later learned was a second degree sunburn. It hurt to move around and I later didn’t leave the house for three days and developed a blister I can only describe as a living, breathing creature. So, the moral of the story is Union Pool is a lot smaller than Sunnyvale, which means there’s a higher likelihood your fragile skin will be brushed by moving bodies. Don’t forget sunscreen if you’re going to the beach beforehand, and don’t use the spray-on kind. 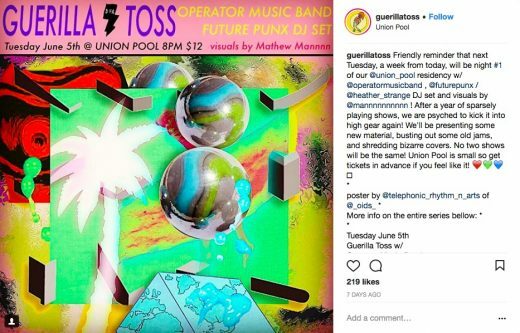 Guerilla Toss plays Union Pool with special guests June 5, 12, 19, and 26.